I am pretty excited to share our experience with Homeschool Spanish Academy’s Middle School Program with you today! 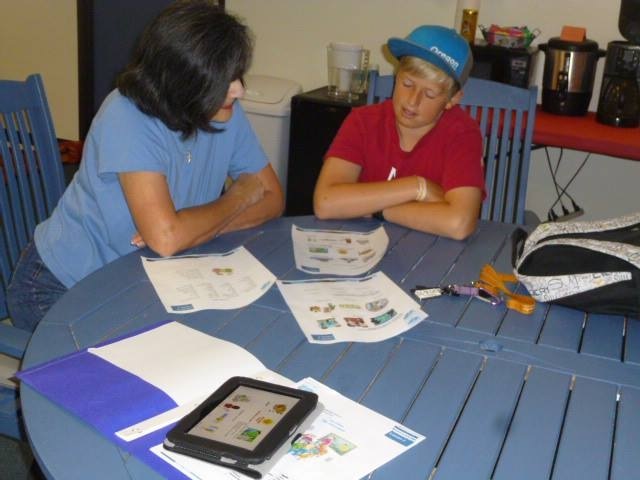 We learned that the Homeschool Spanish Academy is an online tutoring environment. 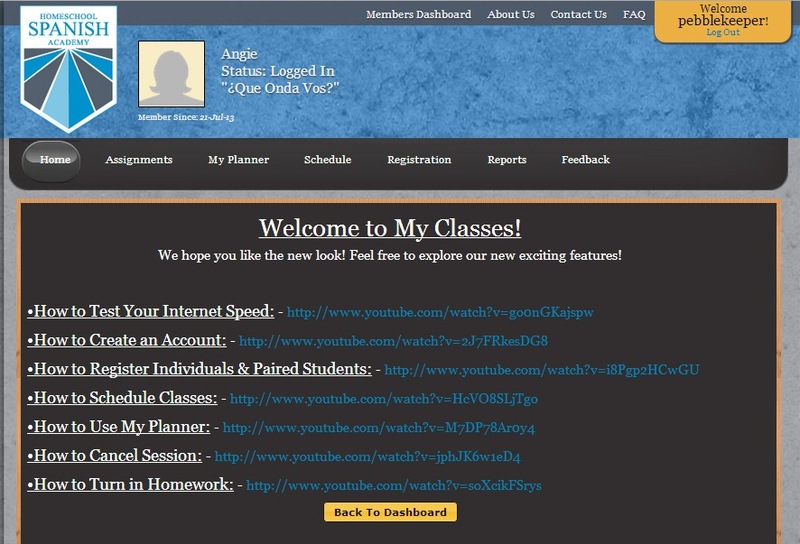 Here is what made us stoked about the program: It uses SKPE for the teacher! Woot Woot! Here is a preview of “How a Lesson Works”. Pretty cool right? There are several levels, we choose the Middle School Program for Jon, our 7th grader. He is 12, and it is directed at 12-15 year olds. The Teacher, we loved Elda, gets to know the student a bit in the first session. She asks quite a few questions to find out what level of Spanish understanding Jon had. Which was none outside of ordering from Taco Bell once every two months. So our first lesson was on Sounds and simple words. Jon had a hard time with the pronunciations of the sounds/words. He kept trying to force his lips and tongue to create the word, adding in a lot more sounds that was needed. Kind of funny to watch, but it did mean we used Lesson 1 two weeks in a row. For some reason he can. not. roll his R’s. He practiced for HOURS. I thought Whistling and Spoon Playing practice was a hard phase. Oiy. Oh, and the class was super fun. She said hello to the family members and even a friend spending the night. We got to show her the lake through our Skype camera, and she remembered details that Jon had shared. The class is about 50 minutes long. A short chatty time in the beginning, encouragement to practice, and then deep into the lesson. When his lesson officially started in earnest, Jon was left alone in quiet room with his headphones to focus. This would be my advice is to make sure there is a quiet spot to really dig deep into the lesson. Lesson 2, for Jon, covered quite a few of the greetings and daily conversation starters. He also did this class for 2 weeks. He had fun sharing his new skills at La Roca, our favorite after surf spot here in Lincoln City. The staff was really sweet to help him out and encourage him to practice hard. And that is what we got from our Teacher Elda – always encouraging to practice. Jon really felt the connection with the live link to Elda. Lesson 2 brought us to a new step with Homework. The photos above are from the PDF that gets emailed to you after your session. Lesson 1 had a PDF to help you practice. It covers all of the screen shots during class. Lesson 2 had a second PDF of homework that you fill out after practicing, then a 3rd text file to fill in your answers and turn in your work. 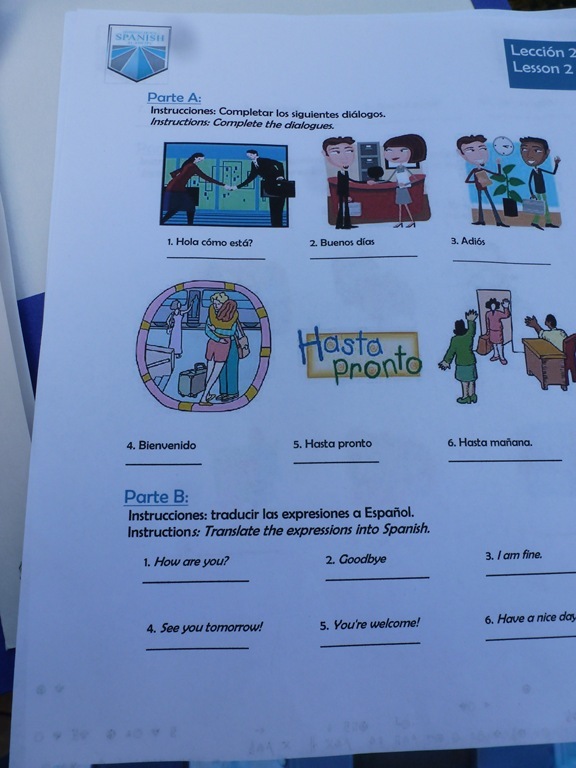 Some of Lesson 2’s homework was challenging, you start reading the Spanish Language right away. You turn English to Spanish, and then Spanish to English. There are visual prompts to help you through the practice homework. Which leads us to Lesson 3. This is where we had our only disappointment with the program. 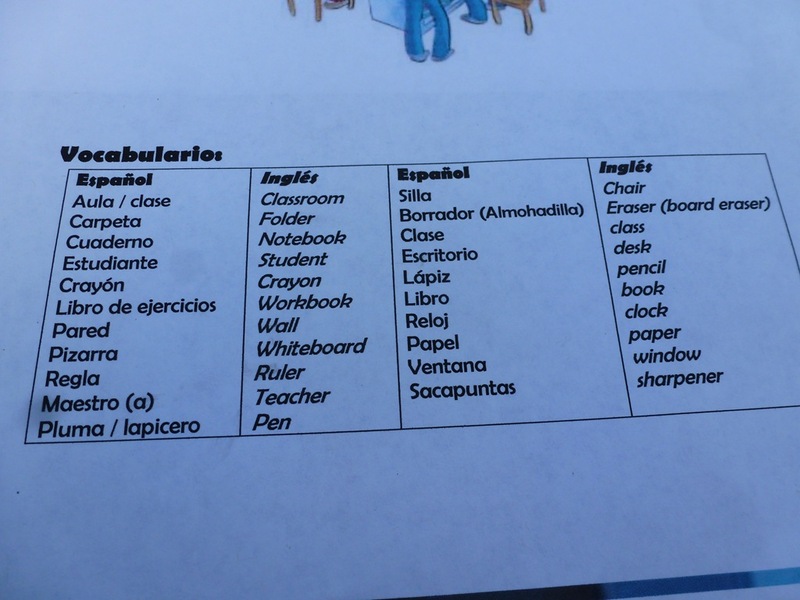 This is, after all, Homeschool Spanish Academy. Lesson 3 was based on all of the vocabulary in a large classroom. It sort of threw Jon into left field, and we felt the lesson was rather advanced quite suddenly. Maybe Elda thought Jon was up for a challenge. However, these words are not normally used in most of his day to day conversation, and didn’t challenge him to practice on his own. Then, with this homework, you would type out the answers into the text file and upload them back to the teacher. Both Jon and I were a little stumped. So we asked our Missionary to Juarez, Mexico ~ Pastor Friend in Lincoln Beach to help us. She helped Jon slow down and learn the pronunciations. 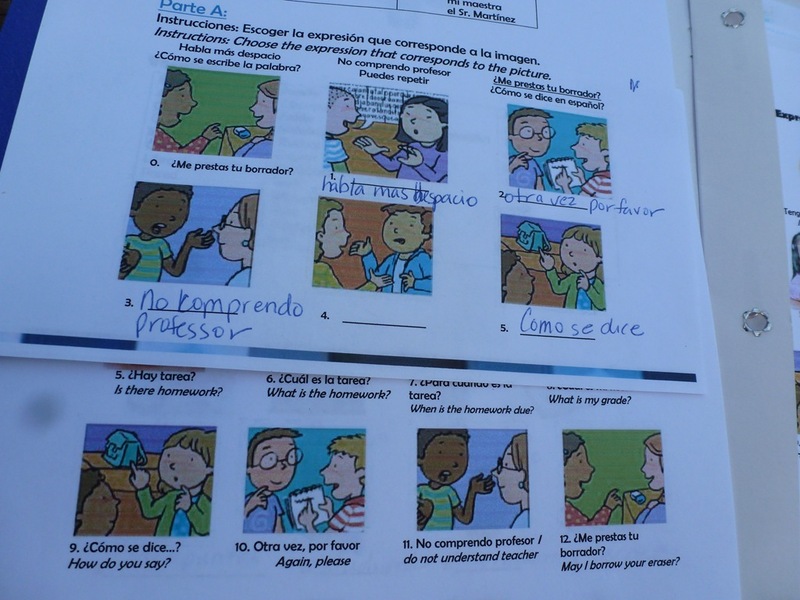 She was also able to read the Spanish homework and ask Jon questions so he could answer the homework. I wrote down what they were saying on a separate printed lesson sheet. That brings me to my second discouragement point. The great idea of the Skype Immersion is that they will learn faster. However, there was a slight communication gap between the teacher understanding Jon and Jon understanding the teacher. 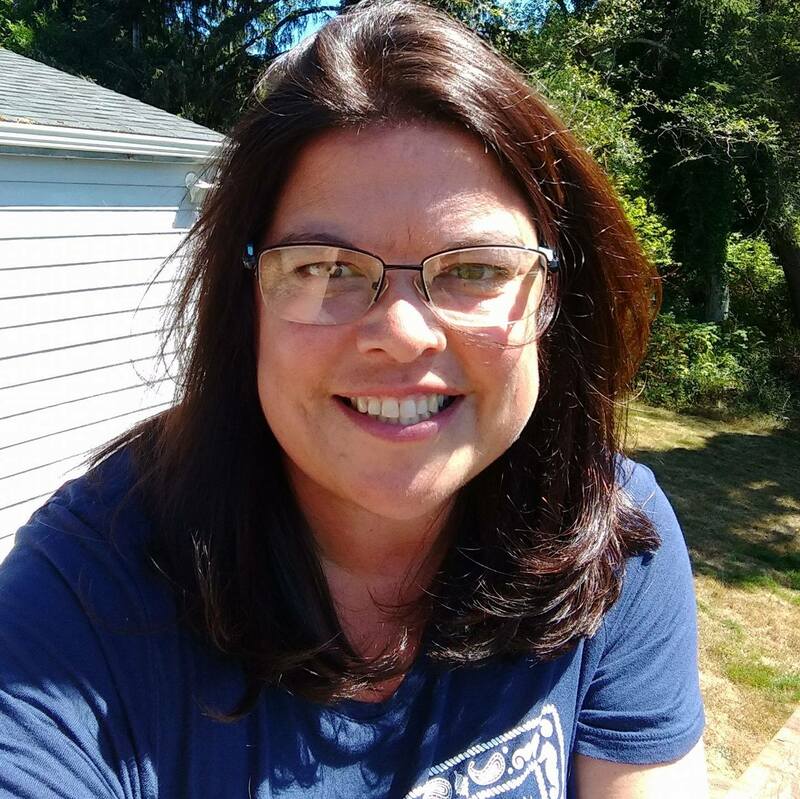 If you have local Spanish speaking friends, they will be a great bridge gap of help. No one in our family has taken Spanish lessons, so we were pretty green. 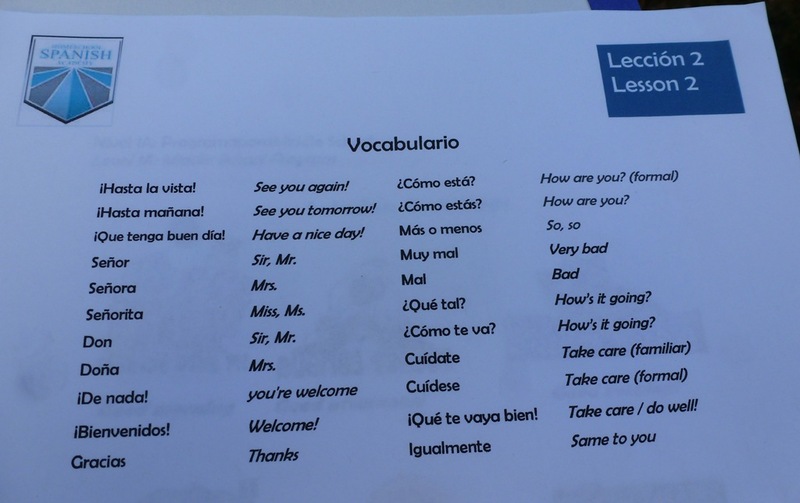 That said – After 5 lessons – Jon is chatting in Spanish often. He is practicing it in the car. Trying it out with friends. He wants to continue to learn Spanish. Is the Homework Difficult – sure. But he did it. Is the communication barrier a bit of a challenge? Sure, but he understood enough to get his work completed and his vocabulary to grow. Don’t let these be hindrances, just don’t get frustrated and work through them. 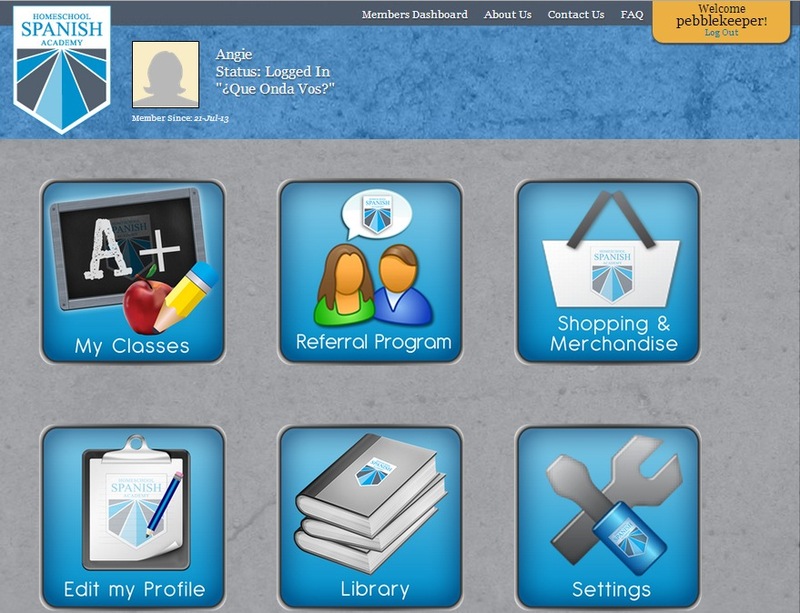 A few shots of what to expect once you log in – Here is your home page/member dashboard. You will remain focused on the My Classes button. 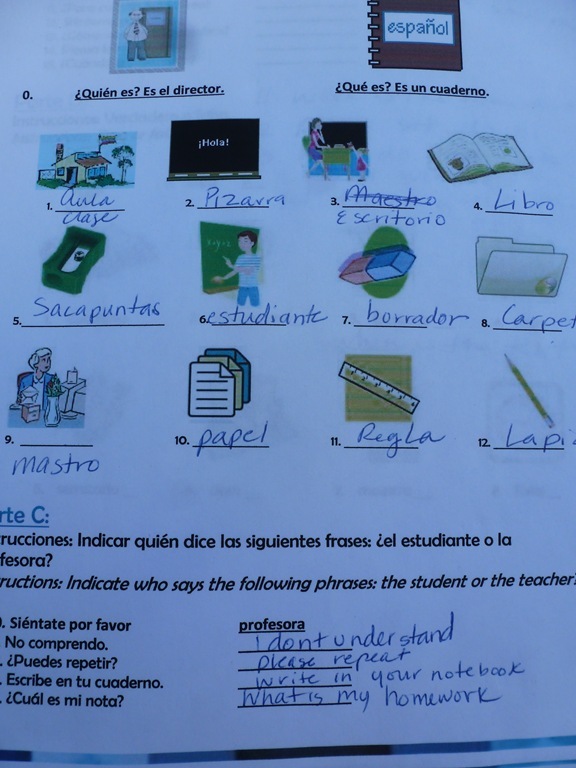 Homeschool Spanish Academy wants you to be successful. They do not want any of the internet/skpe/downloading-uploading homework/etc to be difficult. They have created several youtube videos that will direct you easily through every single step of the program. Using this program on line should be quite simple. Their staff was/is amazing to work with. We had a technical help phone call the day of our first class. He led us through the Skype connection and made sure all of our equipment was working properly. Oh – There is a link on their page to help you see if your computer will work with their system, I suggest you test your connection with their tools. 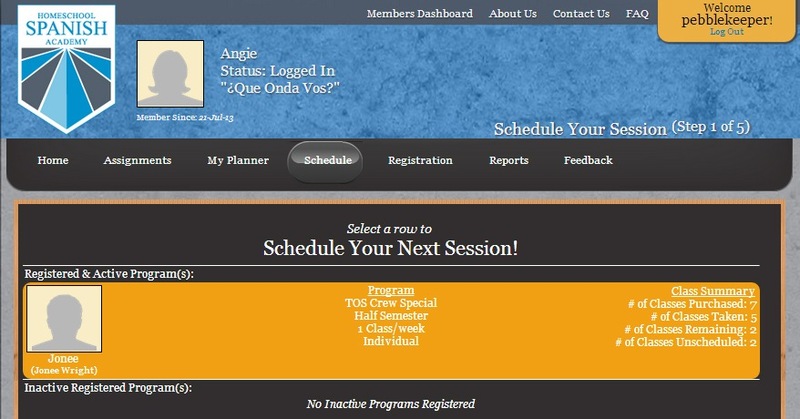 Back to the Member Dashboard, there are links there for Assignments, MyPlanner, and Schedule. They keep the tutorial videos right there as well if you forget from week to week how to schedule a class or turn in homework or cancel a session. 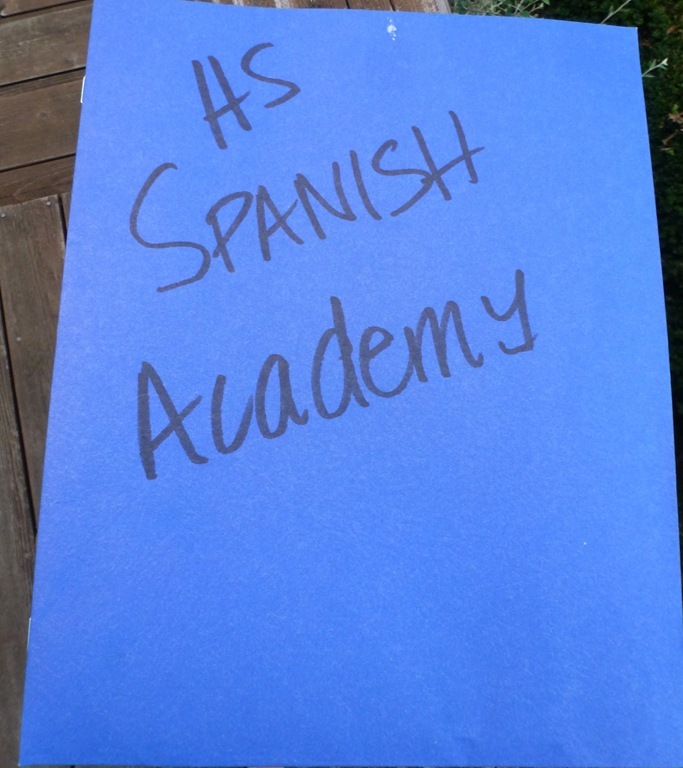 All in all, we enjoyed the Homeschool Spanish Academy! We still have 2 lessons left with our review product we were given from the Schoolhouse Review Crew. With school starting up, Elda having a baby (JOY), and a bit of shifting, the schedule was pretty tight and not matching up with our Surf Team practice. This week I plan on getting on and scheduling the last two. I’d suggest that you print out the homework. You can see above that the PDF transfers easily to the computer/laptop/Kindle HD. Jon just seems to do better with paper. 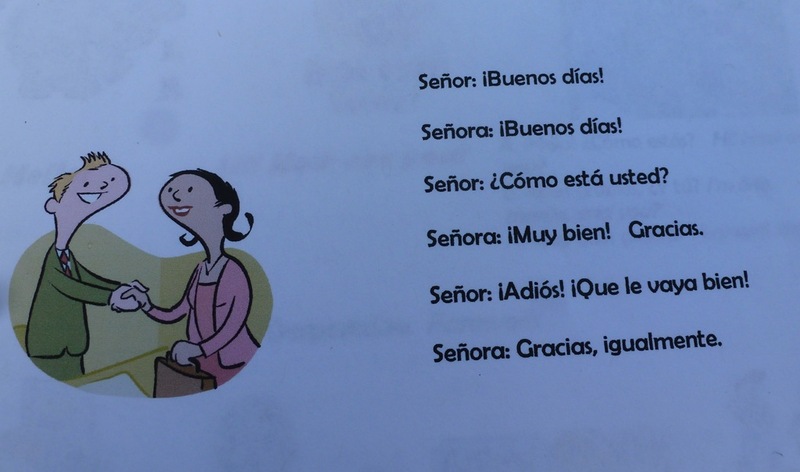 We are thankful for this jump start to learning Spanish in our family. If you have any questions, feel free to ask. It really is a pretty large program, I hope I have described our experience well. Several crew members also reviewed this product. If you click the graphic below you may see their experiences as well. 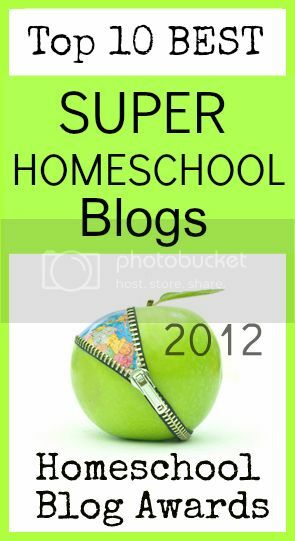 This entry was posted in Language, Reviews, Schoolhouse Crew, Some Schooling and tagged HomeSchool, homeschool spanish academy, homeschoolspanishacademy, HSBlogger, hsreviews, lessons, Middle School Boys, Online, skype, spanish. Bookmark the permalink.